The bestselling guide is now filled with new, essential information for knowing whether you or your loved one suffers from this chronic but very treatable disease. 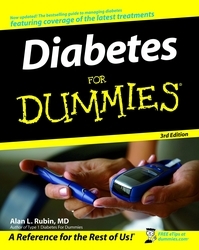 Diabetes For Dummies, 3rd Ed. Ever since the first edition of "Diabetes For Dummies" was published in 1999, the book has been a major resource for those with diabetes and their loved ones, as well as drug company representatives and researchers trying to find a cure. Since the previous edition, more than 2 million additional people have been diagnosed with the disease. Unfortunately, a large number of them are children. To update the book and provide the best medical care for his patients, author Alan L. Rubin, MD, has followed the latest developments closely. Among the many findings, readers will discover new explanations for the complications of eye disease, kidney disease, nerve disease and heart disease that develop when diabetes is not controlled. High blood sugar (glucose), through a variety of mechanisms that are explained in the book, may damage just about every organ in the body - especially the eyes, kidneys, nerves and heart. Solution? Start with lifestyle change and, if necessary, add medications to bring the blood sugar down into a range that is as normal as possible. High blood cholesterol damages the arteries and can lead to heart attacks, strokes and blockage in the arteries of the legs and feet. Solution? Start with lifestyle change and add medications if necessary to bring the total cholesterol and the bad cholesterol down, while bringing the good cholesterol up. High blood pressure damages the arteries and adds to the damage in the kidneys and heart caused by high blood sugar and high cholesterol. Solution? Start with lifestyle change and add medications if necessary to lower the blood pressure to less than 120/80. The book covers both new developments for managing weight and tried-and-true methods for weight loss. It includes an in-depth discussion of exercise (how much you must do and the most helpful types of exercises), new information on the positive effects of resistance training (weight lifting), and a comprehensive discussion of all available medications with particular emphasis on Dr. Rubin's own experience using them. "Diabetes For Dummies, 3rd Ed.," provides information and tips on the latest products and devices that can help the person with diabetes control blood sugar. Not every new device will help lower blood sugar. Dr. Rubin has tried them all and offers not just his opinion, but also those of leading experts in the field. Unfortunately, in many instances, such experts have a conflict of interest; they receive funding from the device maker or are paid to lecture for them. Dr. Rubin has no such conflict of interest and can be trusted. In typical For Dummies® fashion, the book concludes with "The Part of Tens," including ten ways to prevent or reverse the effects of diabetes and ten diabetes myths debunked. Since diabetes in one person affects all members of a family, Dr. Rubin also provides ten ways to get others to help you. The appendix supplies a mini-cookbook made up of recipes from great restaurants and the best web sites for further details about diabetes. A handy "Cheat Sheet" in the front of the book lists the most critical information and where to find much more throughout the book. Alan L. Rubin, M. D. is a physician with an active diabetes practice in San Francisco, California. After "Diabetes For Dummies," now available in 14 languages, Dr. Rubin published "Diabetes Cookbook For Dummies," "Thyroid For Dummies," "High Blood Pressure For Dummies," and the recent "Type 1 Diabetes For Dummies." With the exception of the last book, all are in second editions and have been bestsellers. By Alan L. Rubin, M. D.